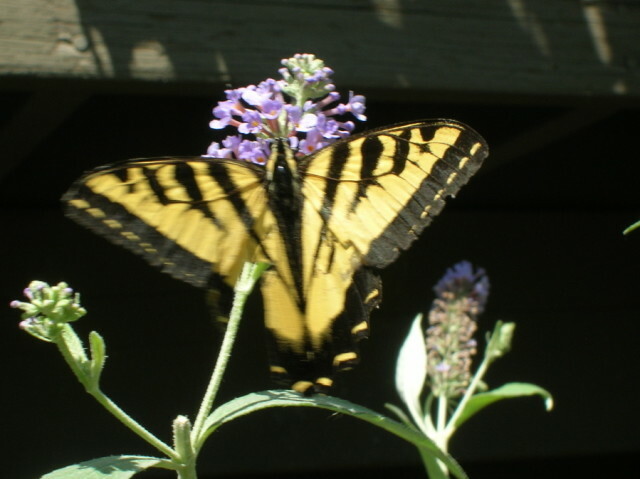 A swallowtail enjoying the nectar from an invasive plant, butterfly bush (Buddleia davidii) – learn about both the butterfly and the butterfly bush, this weekend. This Friday, Saturday and Sunday hold some fantastic garden-related events: you can buy quality native plants, train to identify invasive weeds, tour ten fabulous Naturescaped gardens, and – my favorite – learn about native pollinators at a seminar at the Zoo. This seminar will cover pollinators and pollinator conservation including native bee biology and identification and choosing plants and creating habitat to support pollinators around your home, garden or farm. Register on line. The cost – $33 – includes lunch and zoo admission. For more information, contact Melissa Protz: 503-226-1561 x5868. Help protect Oregon’s landscape by preventing the spread of harmful invasive species. You’ll discover tips to identify, locate and report invasive species before they become a problem, with live and preserved invasive specimens to examine. Details here; register here. Organized by the Backyard Habitat Certification Program and East Multnomah Soil and Water Conservation District’s Naturescaping program. Visit 10 Certified Backyard Habitats – tour the gardens, chat with garden hosts, and gather ideas for naturescaping your own yard to create habitat for native creatures including birds and insects. Register on line here. If you’re interested in turning your own garden into a Certified Backyard Habitat, sign up for a home visit here. For information about this and other Audubon events, go to the Audubon Society’s calendar.